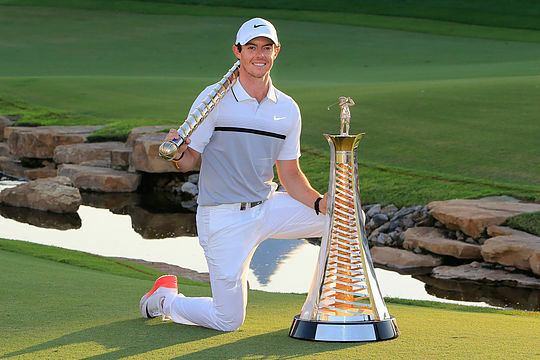 Rory McIlroy was crowned King of European golf for the third occasion in the past four years winning the Race to Dubai title and also capturing a second DP World Tour Championship in four years. McIlroy was in a class of his own coming from one shot back heading to the last day of the season’s final event and absorbing everything young Englishman Andy Sullivan threw at him. The only real hiccup for McIlroy, who has now won four times in Dubai, was finding the water at the penultimate hole for bogey to eventually win by a stroke with a round of 66 for a 21-under par tally. McIlroy silenced any threat from nearest Race to Dubai rival Danny Willett, who bogeyed two of his three closing holes in a score of 70 for a share of fourth place but with a distant 13-under par on the Earth Course at Jumeirah Estates course. McIlroy, who will remain at World No. 3, earned a first prize cheque of €1,230,972 to take his European Tour career earnings alone to over €27 million. “To be European No. 1 for the third time in four years was a goal of mine at start of the year, in the middle of the year, and coming here this week,” he said. McIlroy will spend the next eight weeks or so more in the gym than on any practice range working on building back the strength in his leg and also promising there will be no off-season social football matches. “I want to try to get healthier and stronger again and get my body back to where it was before the injury as I haven’t been able to do that over the past few months,” he said. Despite a solid opening round of 66, Marcus Fraser was the best of the Aussies at T34 while Scott Hend had to settle for 58th following rounds of 77, 69, 74 and 69.